Bhote Koshi is one of the best short river rafting in Nepal with intense and thrilling whitewater rafting venture. Bhote Koshi river rafting offers abundant photographic moments and chances to visit unexplored archaeological sites and unrestricted areas. It is the steepest river rafting in Nepal, with continuous rapid action and one of the fastest flowing rivers with lots of ups and downs. Bhote Koshi River rafting is the most popular whitewater rafting rivers in Nepal. The origins of this river's name from Bhote meaning coming from Tibet and Koshi meaning river, Bhote Koshi, the river that barrages from Tibet. Bhote Koshi river rafting is a thrilling and the adventitious rafting tour that offers you not only the exciting rafting ride but also a fascinating mountain view and natural beauty. Bhote Koshi rafting is a fascinating rafting destination designed for those who seek for adventure and thrill over the river. Starting this rafting requires rafting experience. Drive from Kathmandu to Lamosanghu, where you start your water journey. On the first day, you will raft half of your rafting route and return back to your resort or our camp to spend the night. Although short, this is a very exciting section of the river, filling you with thrill and adventure. After breakfast, your rafting starts from Lamosanghu. Lunch will be served en-route on the river bank. You have an action-packed, thrilling day. Drive back to Kathmandu from Dolalghat. Government taxes, service charges, etc. 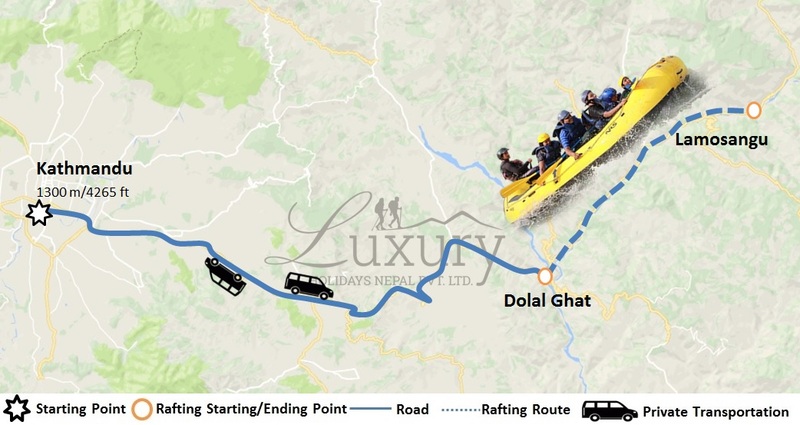 Luxury Holidays Nepal will offer you luxury vehicle for Kathmandu-Rafting-Kathmandu.